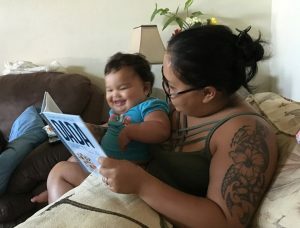 Through a partnership with a local nonprofit organization called `Ohana 100, all of our Early Head Start children were able to receive books for their home libraries. Reading to and with young children is one of the best indicators of later school success. The more young children are read to, the greater their interest in mastering reading. Reading out loud exposes children to proper grammar and phrasing. It enhances the development of their spoken language skills, their ability to express themselves verbally. Child attends to, repeats, and uses some rhymes, phrases, or refrains from stories or songs. Child handles books and relates them to their stories or information. Child recognizes pictures and some symbols, signs, or words. Child comprehends meaning from pictures and stories. Child makes marks and uses them to represent objects or actions.